In 2015, the Sea Turtle Conservancy and the Anna Maria Island Turtle Watch (AMITW) began a sea turtle education and conservation project to study the migration patterns of threatened loggerhead sea turtles (Caretta caretta) nesting on Anna Maria Island on the Gulf coast of Florida. The study will reveal important information about the turtle’s migratory behavior, including migratory routes, foraging grounds, and the areas of potential conflict with commercial fisheries or legal harvest of sea turtles. This critical information will enhance the ability of resource managers and conservationists in their efforts to protect loggerheads, both in U.S. waters and through international conservation efforts.The satellite transmitter attached to each loggerhead sends signals to orbiting satellites each time the turtles surface to breath. The data will be collected and downloaded to STC researchers. The information gained from this study will improve estimates of adult nesting population size, identify movement patterns and expand the knowledge on feeding ecology. Educational migration maps will show the best location points of the turtle’s movements and locations. This will allow interested persons all over the world to watch along as researchers discover where the sea turtles travel after nesting. Through STC’s online educational program, the public is invited to watch along on the Internet as we learn more about these amazing animals. 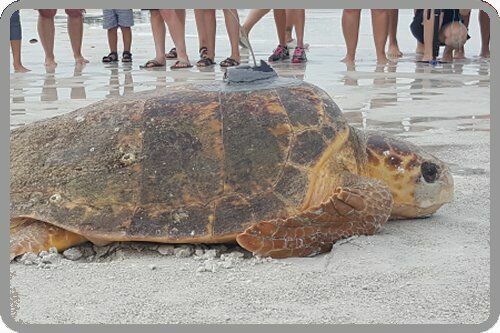 BORTIE – Bortie is an adult female loggerhead sea turtles released on June 19, 2018 with a satellite transmitter after nesting on Coquina Beach. She measured 87.1 cm in curved carapace (shell) length. Bortie is taking part in the 2018 Tour de Turtles and was named by her sponsors, Anna Maria Island Turtle Watch, Bortell’s Lounge. & Waterline Marina and Resort. ELIZA ANN – Eliza Ann is an adult female loggerhead sea turtles released on June 20, 2017with a satellite transmitter after nesting on Coquina Beach. She measured 109.5 cm in curved carapace (shell) length and 110.7 cm in curved carapace width. Eliza Ann is taking part in the 2017 Tour de Turtles and was named by her sponsors, Anna Maria Island Turtle Watch & Waterline Marina and Resort. AMIE – Amie is an adult female loggerhead sea turtles released on June 23, 2015 with a satellite transmitter after nesting on Coquina Beach. She took part in the 2015 Tour de Turtles and was named by her sponsor, Anna Maria Island Turtle Watch. The name Amie stands for Anna Maria Island Elementary.